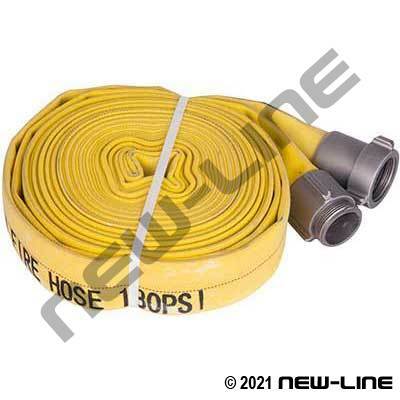 NL9720 is designed as a light duty, cost-effective open ended discharge hose or for standby forestry fire protection (not ULC/FM listed/labeled). Due to its light duty characteristics, we do NOT recommend this hose be used for washdown, construction, rental, mill service or in plant applications. For washdown service we recommend using a heavy duty water discharge hose or a fire hose with heavier properties (such as NL2005 Black Ribbed, NL9750 Red Armtex, or NL9780 Yellow Double Jacket). We also offer an entry price point, non-treated white hose (A9715) as a competitive option to lower end, one time use type standby forestry fire hoses that are on the market; it should be noted that this hose is not designed for washdown, dragging, or longer term use - it does not have a protected reinforcement and will fail once the cover is frayed. With regards to forestry ends, we recommend our lightweight aluminum ends rather than the 'brass' which are heavier and subject to warpage.